I can’t believe how long it’s been since I’ve provided a new post. All the items I mentioned in my last post Unfinished Business are now complete. Back in Oct 2010 I was having trouble keeping pressure in my water line from the lake. I had the gash in the water line fixed and after a few weekends of getting all the air pushed out of the line it finally primed. I’ve got 50psi and everything seems to be working fine. The heat line has been great meaning I’ve had no problem getting water throughout the winter. I finished connecting the drainage plumbing for the kitchen sink and I’ve installed the corner shower. I now have hot and cold water running and I’m able to take a shower and wash dishes. This is a huge change from the way I’ve been living up there and makes things much more civilized. To make things even more comfortable I connected the satellite dish so now I have TV and satellite radio to listen to, which is another bonus since choice of radio stations is pretty poor up there. This past weekend I had a few friends up to help and everything ran very smoothly. We were able to finish the flooring in the last bedroom, hang the interior doors, and hang the kitchen wall cabinets and range hood microwave. Again such small things seem…well…small, but to have a door on the bathroom provides much needed privacy. Cabinets on the walls means cups and dishes can be put away rather than in boxes on the floor. And warming food up is a breeze now with the microwave. On top of that it all looks good! The remainder of things to do are very small, like baseboards, trim, and blinds. This summer will be focused on outside of the cottage and landscaping. I’m looking into alternatives to grass for the lawn so I don’t have to worry about mowing it all the time. I’ll let you know what I find. I haven’t provided an update lately because I have a number of tasks on the go and none of them have been completed. But to let you know I met with the electrical inspector and he passed the final inspection so that is out of the way. I’ve finished clear coating all the pine walls and have painted the bathroom…I hate painting. I had some friends come up to give me a hand with the flooring. It’s 12.3mm black walnut laminate and it looks pretty good if I do say so myself. We’ve floored one of the bedrooms upstairs, all of the living room, kitchen, bathroom, and front hall. I still have the main level bedroom and the master bedroom to finish the flooring. This past weekend I installed the base kitchen cabinets, but still have the upper cabinets over the stove and set of drawers. The kitchen counter top was measured incorrectly and was too long. I unscrewed the backsplash cut about 3/4 of an inch off and then sanded it smooth with a belt sander. 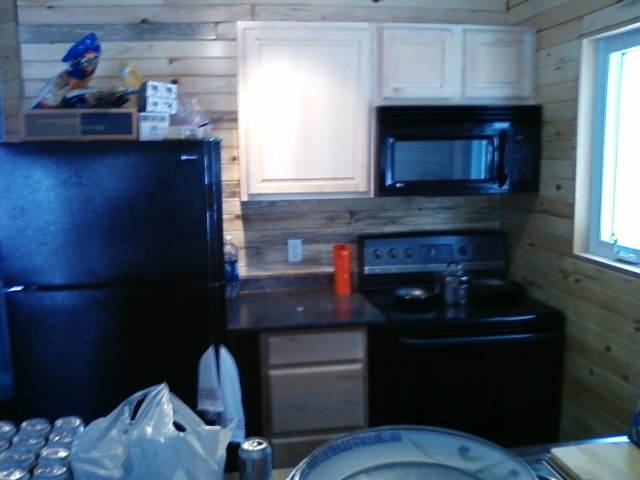 I screwed the backsplash back in and it turned out better then I thought it would. Once that was done I marked where the kitchen sink needed to be and cut a hole with the jigsaw for the sink. That turned out well as well so everything is good from the sink perspective. I have to pick up a couple of parts to connect the drainage plumbing, but that should be relatively simple. In the bathroom I’ve installed the vanity cabinet and sink and the toilet. I’m working on the corner shower kit now. The instructions are terrible and I’ve been fighting with it quite a bit, but I’m on the right track now and should have that finished shortly. I’ve been having trouble with the water pump keeping pressure and found that I had a big gash in the line from the lake. I got that repaired and I’m going to have a plumber come in and get the line primed. The way I’ve got my line setup isn’t conducive to priming so I thought I would pay a professional to get it done. I don’t have the tools or experience to do it easily. Cinderblocks used to hold water lines down can wear away the line and cut it. It’s better to take two bricks with holes in them and some wire connecting the bricks to lay over the line. You won’t have to worry about wearing a hole in your line and it is much easier to move the water line then with cinderblocks. Shower kits that come with a no caulk drain that just has a rubber gasket and no tightening device are not code and will leak. Get the glue in shower drain or one that has a tightening mechanism. Kitchen sink drainage pipes can have an offset output or a centred output. The plumbing book from home depot says that it isn’t code to have a centred output in Canada, but it is wrong. Finding a satellite signal isn’t easy. By early November the kitchen and bathroom will be installed and I’ll work on the flooring, doors, and trim over the winter. Next summer will actually be spent out doors doing some landscaping and just having fun. I look forward to it! What a difference! Most of the knotty pine is up on the walls with only the stairwell to go. The rooms seem bigger and brighter to me and I’m very happy with the work. The mill where I got the wood often has Spruce and Pine mixed together so the contractor separated the Spruce and used it all in one bedroom. There really isn’t much of a difference to the Pine and Spruce. The Spruce looks a little lighter and the knots are smaller, but that’s about it. I like it. The next step is for the contractor to finish the job and for me to stain it all. I’m going to go with a clear coat non-yellowing polyurethane. I’m trying to determine if I’m going to brush, roll, or spray it on. Brushing seems like it will take too long, rolling will create too many bubbles, I think, and spraying seems complicated. So we’ll see what happens. I would have started staining this past week, but when I got to the cottage I found water in the basement and one of the pipe joints at the water pump broken. At some point during the week the connection from the pressure tank to the pump broke and sprayed water all over the place. I spent most of my Saturday replacing the plastic joint pieces with galvanized steel and trying to get the pump primed again. Then I had to clean up the basement which was full of soggy wet stuff. Nothing ever seems to go to plan when I go to the cottage. Anyway I got all of that done and found that my pump isn’t building up enough pressure to shut off. I opened it up to find the impeller cracked and needs to be replaced. I’m sure that means at least half a days work and water everywhere again. I think in a week or two we will see a big change in the appearance of the cottage as we start into the finishing projects, flooring, cabinets, and plumbing. I’ll keep you updated. It took much longer then I thought it would but, the insulation and vapour barrier is now finished and inspected. I decided to use Roxul rock wool insulation for a number of reasons. The rock wool is fire retardant, it doesn’t collapse on itself over time like the pink stuff does leaving parts of uninsulated walls, but the main reason was the ease of installation. The insulation is installed by compressing it in between the studs or rafters and then letting it expand. As long as you have 16 or 24 inch centered studs or rafters the insulation holds itself in place. If the space between your studs is smaller you can easily cut the insulation with a bread knife. Again very simple to install and the price difference to the pink stuff isn’t that much. So I insulated the attic with 2 layers of R22 giving me R44, the exterior walls in the upper and main level with R22, the basement with R14, and I insulated the interior walls with Roxul Safe ‘n’ Sound to provide a bit of a sound barrier. The vapour barrier, on the other hand, was a much bigger job then anticipated. Between taping the ceilings, vapour boxing the outlets, and using that awful Acoustic Sealant around the windows, doors, and along the base of the walls I was extremely happy when the job was finished. While I was doing that I had a plumber come in and install the water pipes, hotwater tank, pressure tank, filters, pump, pipe to the lake, and the heat line (to make sure it doesn’t freeze in the winter). While I wasn’t overly pleased with this plumber he has been more then willing to come back and change/fix anything that needed to be changed/fixed. The plumbing inspector took a look and gave it the thumbs up. My next step was to get a contractor in to drywall the place while I stayed home with the family for a few weeks and then I’d come back to paint. That plan went awry when I could only get one contractor to call me back and he quoted me at $16,000! That was way out of my budget. So with a couple of buddies we hung drywall on the ceilings on the main floor and green board in the bathroom. I’ve mudded, sealed and painted the ceilings with no major blemishes so I’m quite content with the result. Instead of drywall I decided to go with tongue and groove knotty pine that I will get from a local mill. The mill will also install the pine for a price that is very reasonable and falls within my budget. This should be complete in a couple of weeks. I’ll continue to work on the bathroom while the pine is being installed and we should see a drastic change in the looks of the cottage by the end of the month. The dock is in and we keep rolling on! We went to the Cottage Life Spring Cottage show and visited a number of dock vendors before finally picking Rideau Docks. They appeared to be a smaller company (family run) then many of the other vendors, but their prices were good and I liked dealing with the people there compared to some of the other vendors. 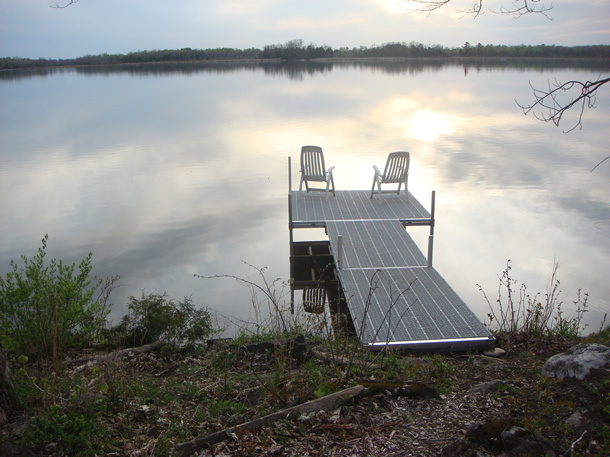 We went with an aluminum framed dock with posts and feet that will just sit on the lake bottom. We decided to spend a little extra money and get the Thru-Flow decking, a composite of some sort, since it was light weight and maintenance free. Rideau Docks delivered it to the cottage this past Saturday and a friend and I installed it in about 1.5 hours. The dock is made up of 3 pieces. A 4×8 foot ramp connected to a 4×8 foot walkway, connected to an 8×8 patio. Other then getting the patio from the driveway to the water everything was relatively easy. I would guess the patio weighed somewhere around 120lbs. My friend and I were fishing off of the dock that night and had a great time. Having a dock really makes enjoying the lake much easier. In terms of cottage progress I’ve insulated and vapour barriered the main level and upstairs of the cottage. I’m currently building walls in the basement and insulating them. I’ve got one wall left. When that is done I’ll get the building inspector back in to inspect the insulation. I also decided to hire a plumber to do the rough-in water lines. I could have done it myself, but it would have taken me at least a month going up on weekends where this contractor can do it in one day for a reasonable price. So he was in there yesterday and I think he is going back on Friday to finish things up. He has put in the water line to the lake, installed a heating wire so the pipes don’t freeze in the winter, connected the water pump, pressure tank, a sediment filter, a charcoal filter, an ultra violet filter, the water heater, and run the water lines to the bathroom and kitchen. Sometime next week I’ll get the plumbing inspector to come back and approve the waterline rough-in. Once those inspections are complete I’m going to have a contractor come in and dry wall the main floor and second floor. 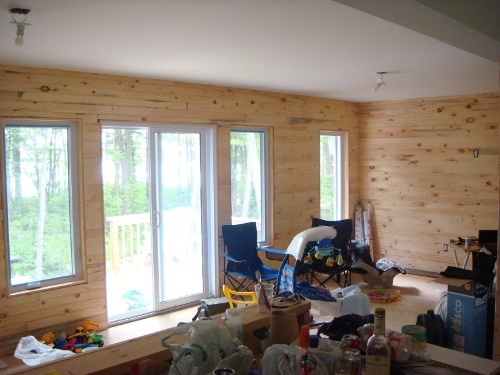 We purchased 12.3mm laminate flooring this weekend, which we will install throughout the cottage once the dry wall has been painted and then it will be a matter of installing cabinets and finishing the plumbing connections. I hope to have everything done by the end of July. Last Thursday was a big day for me. I had the building inspector in to take a look at the framing and I had the plumbing inspector in to take a look at the drainage and vent system. The plumbing inspector was in and out very quickly. He’s having me change how the shower drains are positioned, which means I have to cut out some of the work I’ve done, but it shouldn’t be too bad. Other then that he said everything looked good and passed the inspection! The building inspector took a look at the framing to confirm that the building was built according to the approved plans. The documentation he provided me led me to believe I had to have the insulation and vapour barrier done before he was to come for this inspection so I had already started insulating the upstairs bedrooms. As it turns out, and common sense would tell you, that it’s pretty hard to inspect framing when it’s covered in insulation. Anyway the inspector was in a good mood that day and didn’t make me rip it all out. He wanted to see more blocking in the floor joists of the main floor around the perimeter walls and that was it! So now I can go ahead and finish insulating the rest of the cottage. 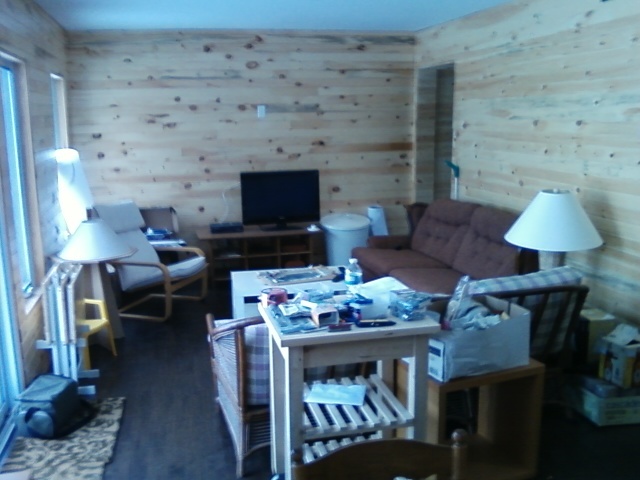 I’ve got about 70% of the cottage insulated and should be done by the first week in March. That means I can turn on the furnace and actually work in a heated building and stay over night instead of driving home at night and back to the cottage in the morning. The next steps will be to get the building inspector back in to inspect the insulation, install the water lines, and hire a contractor to do the drywall. It’s getting close to being a livable building and it’s got me excited to do as much work as I can in the time that I have up there. Hopefully by the time the warm weather rolls around the cottage will be done and I can spend my time on the water catching fish. 2009 is long gone and the cottage still isn’t ready, but there has been some progress since the last update. The rough-in electrical inspection went very well. The inspector was in and out in no time and had only a handful of items he would like to see changed. I’ve made those changes, but I still have a few more things to wire, like the water heater, the water pump, and an outdoor motion detector light. Once that is done, hopefully by the end of February, I’ll get the inspector back in for the final inspection. I’ve managed to dry fit all the drainage pipes. It really isn’t a lot of piping, but the planning involved for a plumbing project is much more detailed then I had expected. There was a lot of cutting and re-cutting and drilling and re-drilling before I got it to the state it is in now. About 2/3’s of it is glued together and I should be able to finish it up this weekend. I’ll get the plumbing inspector in to take a look at it and hopefully it’s up to par. I had started insulating the upstairs bedrooms and attic when I found out that the framing needs to be inspected by the building inspector before the insulation is installed. I thought the insulation and vapour barrier needed to be in before the next inspection. Anyway I popped in the inspector’s office just to clarify. He told be to stop insulating and give him a call when the plumbing and heating ducts were in since those jobs typically tear up the framing. I hired a heating contractor to come in and install a furnace. That was completed over the holidays and the propane was hooked up. So now I have heat, but because I can’t insulate the heat goes through the roof. The plan now is to finish gluing the drainage pipes together, purchase an electric water heater and finish the wiring. Then I’ll schedule the plumbing inspector, the electrical inspector, and the building inspector to come and check everything out. If it’s all good I’ll finish insulating and put the vapour barrier up and then I’ll be able to turn the heat on. Next step is to install all the incoming water lines. It’s been a pretty good year for the cottage so far even if it is cold and rainy every weekend. There has been progress, particularly on the outside as you can see from the picture. We decided to add two more windows to the lake side of the cottage for a few reasons. We will get a better view of the lake, increase air circulation, and most importantly add light to the dining and living rooms. We found out after the cottage was built that the corners of the rooms were very dark. We struggled with the decision to add the windows because we are on a tight budget and this wasn’t in the plans, but now that we have them in I’m very happy we made the right choice. As you can see we also had the siding installed. I found a contractor in the area and he did a fantastic job for a decent price. I’ll be calling on him again when it comes time to drywall. Other little projects outside were adding stairs to the front and back decks. We did a little landscaping and built a picnic table which turned out to be very good. At least we have somewhere to sit and eat and play games now. If you are interested in building a picnic table you can find the plans here. The only outside projects left with respect to the building are to install exterior outlets and put up the eaves troughs. The inside of the cottage is a whole different matter. It is still bare studs, but I did have the basement floor poured in the spring. I’ve run just about all my electrical wires to their boxes and have a rough inspection scheduled for Aug 19/2009. Hopefully that goes smoothly and I can have power throughout the cottage rather than plugging and unplugging extension cords as I am now. I’ve also almost completed my drainage and vent pipes for the plumbing. A few more cuts and it will be dry fitted. From there I have to level it, hang it, and then glue it all together. I’ve met with both plumbing inspectors and both have been extremely nice and helpful. That makes things much easier on a guy like me that is doing everything for the first time. Once the drainage pipes are glued together I’ll run the flexible water supply pipes, no copper or soldering for me. I don’t think that will be too much of a big deal, although I say that about everything, because I only have a kitchen sink, bathroom sink, toilet, and shower to run the pipes to. I’ll be contacting a HVAC contractor soon to install the furnace, water heater, ducts and propane line. Of course this will end up being way more then I’m going to anticipate, but it needs to be done before the winter comes. If everything goes to plan I should be able to have the cottage in a state where we have electricity, plumbing, heating, and is insulated by the end of the year. Which means by next summer it should be fully complete and I can start concentrating on my fishing! Did I mention the fishing on my lake is great? I will in an upcoming post. Thanks for all the comments over the past months while I haven’t been doing much updating. I’m especially enjoying all the comments about the Mantracker show! They make me laugh. Keep it up! Here’s some good news from the federal government with respect to their proposed budget. They are proposing a temporary renovation tax credit for 2009. Now this might not affect a lot of people, but for folks like myself that intended on spending money on building materials or services this is a nice little perk. The HRTC will apply to eligible home renovation expenditures for work performed, or goods acquired, after January 27, 2009 and before February 1, 2010, pursuant to agreements entered into after January 27, 2009. The 15-per-cent credit may be claimed on the portion of eligible expenditures exceeding $1,000, but not more than $10,000, meaning that the maximum tax credit that can be received is $1,350. The credit can be claimed on eligible expenditures incurred on one or more of an individual’s eligible dwellings. Properties eligible for the HRTC include houses, cottages and condominium units that are owned for personal use. 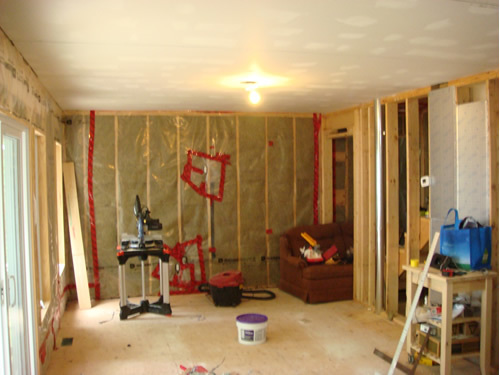 Renovation costs for projects such as finishing a basement or re-modelling a kitchen will be eligible for the credit, along with associated expenses such as building permits, professional services, equipment rentals and incidental expenses. Routine repairs and maintenance will not qualify for the credit. Nor will the cost of purchasing furniture, appliances, audio-visual electronics or construction equipment. Taxpayers can claim the HRTC when filing their 2009 tax return. There have been some requests lately from readers that would like to follow the same steps I did in building a cottage and they are looking for costs to put a budget together. I know where they are coming from because before I started all this I couldn’t find any costs or quotes or even a task list of things I would need to pay for. So I thought I would list some of items I paid for and their approximate costs to help folks out. Take into consideration regional prices, taxes and the size of the building. 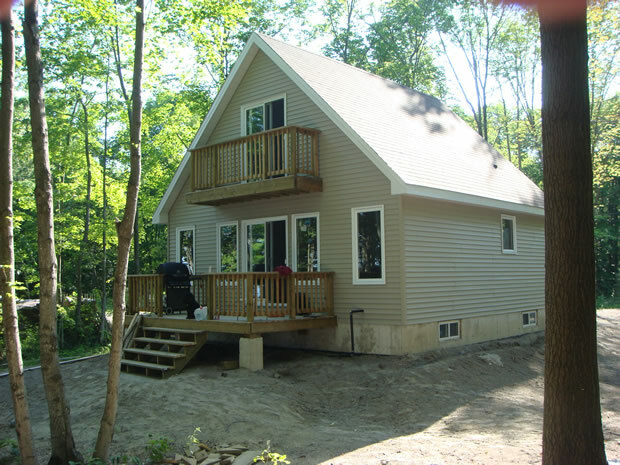 Install electrical wiring throughout the cottage – ?